By coming out of the closet as an active, male pro athlete, Jason Collins has redefined the possible. It was once believed that a human being couldn’t run a mile in under four minutes. Physicians wrote academic articles that the human anatomy wouldn’t allow for such exertions. Four minutes, we were told, was the Maginot Line of our physical capacity. 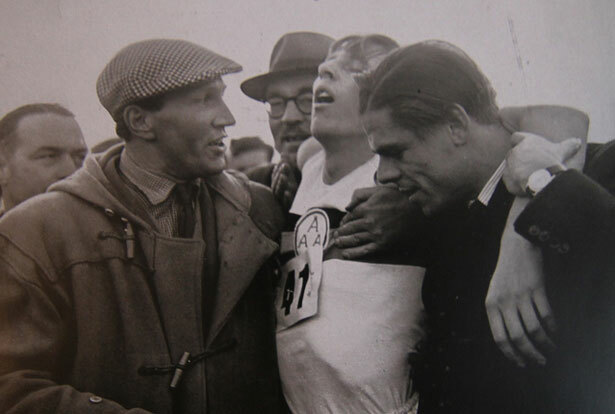 Then in 1954, a medical student named Roger Bannister ran the race in 3:59 and it was like the running community awoke from a collective hypnosis. Mass psychology had shifted in decisive fashion. Within a week, Australian runner John Landy ran it in 3:57 and sub-four minute miles became the world-class average instead of the unapproachable standard. People’s minds had to dramatically adjust to a new reality as the inconceivable became the new normal. There are many calling Jason Collins’s decision to be the first active male athlete to come out of the closet a “Jackie Robinson Moment,” after the man who smashed baseball’s color line in 1947. But I consider this to be more of a Roger Bannister Moment. For years, people have been waiting to see whether an active male athlete would come out of the closet. For years, people of all political stripes said it would be a long time coming. For decades, media and management has policed the sexuality of players to make sure the closet door was welded shut. Even those most supportive, until recently, were pessimistic. Just in 2011, Will Leitch of New York magazine wrote, “You probably don’t know the most likely first openly gay pro athlete, because he’s not a pro yet. He might be 12.” Leitch then quoted Jim Buzinski who co-founded the LGBT-focused website Outsports who said, “It’ll be someone who has identified as gay through high school and just doesn’t think anything about it. They’ll just be so talented that no one would even think to deny them.” But we didn’t have to wait ten years and we didn’t have to wait for that irresistibly talented superstar. Instead we have Jason Collins, 34-year-old journeyman center: right here, right now, in 2013. Now that he’s come out, more players will feel liberated and lifted, unburdened by the pressure to be first. More people will explore the parameters of the possible because Jason Collins chose to be a pioneer. That’s why I see this as more of a Roger Bannister Moment. Thanks to Jason Collins, our parameters of the possible have shifted and now our collective thinking will have to change. That’s the power of just being brave enough to dare see what isn’t there. When Roger Bannister was asked how it was possible he achieved his record-breaking feat, he replied, “It’s the ability to take more out of yourself than you’ve got.” That’s what Jason Collins did as well, and we are all the better for it. What’s it like to cross the border without papers? Read Aura Bogado’s review of the interactive La Ruta.